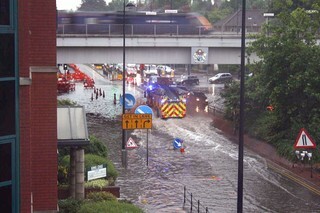 This was the flooding in Maidenhead last Friday, and it’s meant to be happening again. My poor car!!! and it’s Angie’s birthday today. Last year it was seaside time, oh i remember those days! Yesterday we saw The Simpson’s movie in Uxbridge for Zu’s birthday. It was werid watching it with an audience, and the story was surprisingly sad, but it had a happy ending.